Image caption The delay is seen as a reversal, after calls last week for an immediate healthcare replacement. The move reverses Mr Trump's call last week to quickly scrap ex-President Obama's signature law, which surprised some Republicans in Congress. In a series of tweets on Monday evening, Mr Trump wrote that a "vote will be taken right after the Election when Republicans hold the Senate & win back the House". 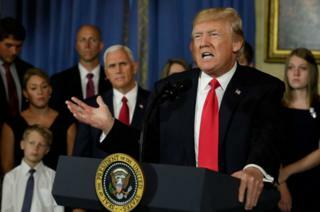 The president's decision comes a week after he called for an immediate replacement to the existing law, declaring the Republican Party would be "the party of healthcare". "Do we have a plan? What's our plan?" Alaska Republican Senator Lisa Murkowski said after their meeting. "He didn't offer a plan," Senator Marco Rubio of Florida also said. Senate Majority Leader Mitch McConnell, who is up for re-election in 2020, told reporters: "I look forward to seeing what the president is proposing and what he can work out with the speaker." The announcement followed the Department of Justice decision to back a federal judge's December ruling that found all of Obamacare unconstitutional. On Wednesday, former White House legislative affairs director Marc Short, who is currently working for Vice-President Mike Pence, told CNN that "the president will be putting forward plans this year" to replace Obamacare. Republicans had attempted to "repeal and replace" Obamacare on several occasions in 2017 when Mr Trump's party controlled both chambers of Congress, but failed after Republicans were unable to reach a consensus over what law should replace it. Eliminating Obamacare has long been on the Republican party's wishlist, and was a key campaign promise from Mr Trump. For six years Republicans promised their supporters that action on healthcare - full Obamacare repeal and a cheaper, better replacement - was just a winning election away. They needed to take the House, then the Senate, then the presidency. Then in 2016 they won - everything - and ran into a brick wall, as attempts at "repeal and replace" foundered. For Republicans, this is a bridge too far. Memories of their 2018 mid-term defeats, in which Democrats ran on protecting Obamacare, are still fresh. The last thing they want is to refight those battles - with the added possibility of a court decision throwing the whole system into chaos. Perhaps that's why the president on Tuesday backed away from his promises of a new plan soon, instead announcing that an excellent, but still undefined, healthcare reform would be passed as soon as Republicans won total control of the government in 2020. "Translation: they have no health care plan. It's the same old song they've been singing. They're for repeal. They have no replace." "What a ruse. What a shame. What a disgrace... The American people will not stand for the president playing cynical games with health care," he continued. Texas Republican Senator John Cornyn, the second highest ranking Republican in the chamber, said Mr Trump's announcement does not remove the pressure on his party to come up with a replacement. "That's one man's timetable," he told the Washington Post. "But I intend to continue to try to find ways to provide more affordable choices for people when it comes to their health care." South Dakota Republican Senator John Thune said the decision was "just probably a realistic assessment of what the field looks like for the next couple of years," in a reference to the Democrats' control of the House of Representatives.